I wanted to start writing this post a bit earlier, but I was so close to grabbing that tempting shiny trinket. I could finally see the the path I needed to take in order to avoid the spikes and hit every crucial bounce wire. "Just a few more tries," I thought. One minute and ten failures later, I still had nothing to show for my efforts. "A couple more tries," I promised myself. After what felt like several dozen deaths, I looked at the clock and realized five more minutes had slipped by. I figured that wasn't such a bad time/failure ratio and decided to give it a few more tries. After all, I had perfected my strategy; it was only a question of whether my fingers would cooperate. When I hit the fifteen minute mark, I still didn't have a trinket. I did, however, have a deep admiration for VVVVVV. Like N and Super Meat Boy, VVVVVV tempers its punishing difficulty with a generous checkpoint system and extremely precise control. You'll die hundreds of times in VVVVVV, but you'll know exactly why you died and what you can do to prevent it from happening again. The game's gravitational tricks are initially disorienting, but the consistency of its sparse, 2D worlds makes it easy to learn the rules. Every challenge requires some combination of gravitational inversions. There's no middle ground: you're either right side up or upside down. As simple as this to grasp intellectually, keeping the rules straight while maintaining coordination is anything but easy. There is so much going on here from a design perspective. 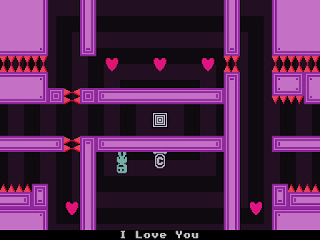 VVVVVV discards the traditional jump mechanic that is the hallmark of almost every other platformer ever created. The floor and ceiling have to function as a cohesive unit in order for the level to work. The sides of the level aren't hard boundaries, which gives rise to an MC Escher effect that only becomes more pronounced in the game's later levels. The player is forced to constantly ascend to avoid the lower spikes, but if they leap up before looking, they hit a second set of ceiling spikes that scroll upward. This is both a punishment and a teaching mechanism: it prevents players from "cheating" by making blind jumps, but it also communicates that such blind jumps are unnecessary. Checkpoints sprinkled throughout the sequence sooth failure's sting while optional treasures provide heightened challenge for those who seek it. All these things remind of the last great platformer I played, Super Mario Galaxy 2. Both games offer intense challenges, but their ingenious designs and consistent rules elegantly convey their gravity defying mechanics. In some ways, VVVVVV is even more impressive because it does all this in two dimensions with only two inputs: run and flip. This simplicity makes VVVVVV's level editor an attractive prospect. I've been wanting to tool around with some level design for a while now, and VVVVVV's low technical requirements and spartan sensibilities are appealing. I think I'll read through some tutorials and then start messing around a little bit. Putting this on the site should be good incentive to keep up with it. I'll be sure to report back with my results (and solicit playtests if/when the need arises!). Maybe I'll even turn it into a regular feature with updates about the learning process. Will look forward to your level efforts - I just managed to beat Veni, Vidi, Vici this morning, so I'm feeling extremely VVVVVV-friendly! I got the game in the humble bundle pack and fell in love with it. I have the same passion for it as I do Super Meat Boy. The thing is each level is so short but to actually master each room can take awhile. It took me a 30 minutes to beat one room but I still was so into it. I guess simplicity goes as long way with game design. Great Post! I was just listening to the podcast. walking down the street (by chance carrying a basil plant) and the second you guys said VVVVVVV a huge grin spread across my face, causing the people around me to give me a few odd glances. I too got the humble indie bundle, which has tons of amazing games (except sadly, Atom Zombie Smasher doesn't work with my video card so I haven't been able to try that), but by far this is my favorite. Just like you Scott, this is the perfect game for me. I have had lots of fun going back through my NES catalogue via roms, and the addition of freezes has made them now playable. The use of checkpoints in this game was exceptional; not only did they make hard puzzles doable, checkpoints became an aesthetic in the game, like the level where there are about a dozen checkpoints in a row that serve no other purpose than to make cool noises as you run through them back and forth (which everyone did, right?). They were even used as obstacles (farther down)! I decided early on that I wouldn't try to capture every single trinket, but just go through the game and see how it went, but each time I saw one I just thought "Oh, I know how to get that..." Even though it took me twenty minutes, I especially enjoyed Veni, Vidi, Vici. Not since the original Battletoads hover-cycle level did I laugh out loud at what a game was asking me to accomplish. This game got me so addicted that after a week of on and off playing I had 19 trinkets, but I did get stuck and finally had to look up how to do "Prize for the Reckless." If you haven't gotten there, here's a quick hint: Checkpoints. Watch out for the spikes, take it easy man!